A couple of weeks ago, my Stake had a very special fireside. 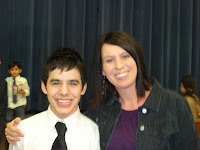 It all started with the Young Women in my ward and their love for David Archuleta! I am the 2nd counselor in the YW Presidency in my ward and the YW LOVE David. Paula Rivoli is the YW Pres in out ward, and she was able to pull off some amazing night for the girls and the rest of our Stake! She saw a picture of David with a a friend of hers', and was able to get a phone number to his pianist Richard. They were able to discuss throwing together a last minute youth fireside, since David was set to be in FL that next week. She then spoke with David's father/manager, and after making a million other phone calls, the fireside came was came together on Saturday night! They announced the fireside that morning throughout our Stake, and I thought the girls would die of excitement. Paula introduced me to Richard, David's pianist, and then invited me to the fireside, since I serve in YW. They left right after sacrament to go and meet David and his father at her house! You'll have to quickly add a 'sorry Brayden, McKenzie, and Monson" on there too....McKenzie is in love with David Archuletta and the boys love his music too---you'll be paying for this one when my kids read your post! What fun! He is soo cute. And he is is areal boy, just like all those girls you teach. That is what makes him great! Paula's the bomb, I already told her. Ok, that is probably the coolest thing ever. When is he going to be in Oregon? Ha ha. Seriously though that is so awesome that he did that. I can just imagine hearing him sing hymns. Awesome! I totally regret not going, I am glad that everyone had such a great time!